Many exciting dining and drinking concepts are signed on as tenants for the incoming The Square at Bressi Ranch, an 87,000 square-foot neighborhood center being developed in the affluent community of Bressi Ranch in North County San Diego. Impending tenants include Bird Rock Coffee Roasters, Mendocino Farms, Richard Walker's Pancake House, Panini Kabob Grill, Ebullition Brew Works, Mango Mango Fresh & Healthy, Wood Ranch BBQ, Casero Taqueria, The Grove Bakery, and Bantam's Roost Gastropub. “Our main goal for The Square, like that at all of our neighborhood centers, is to find the right mix of tenants for the community," Shea Properties Senior Vice President of Retail Leasing Kiril McKee said. Bantam's Roost - From the owners of Flying Pig Gastropub, which has locations in Vista and Oceanside, Bantam's Roost will be an upscale tavern with a pork-centric menu centered around organic, local ingredients. Bantam's Roost will do all butchering in house, make fresh bread, fresh pastas, smoke meats, cure meats and even grow some of its own seasonal produce and herbs. At the bar, they will specialize in boutique wines, local craft beer and a solid whiskey and tequila selection. Bird Rock Coffee Roasters - Recognized by Roast Magazine as Micro Roaster of the Year in 2012, Bird Rock Coffee Roasters has been at the forefront of putting premiere coffee on the map in San Diego since opening it's original location on La Jolla Boulevard in Bird Rock in 2006. Owner Chuck Patton first started roasting in 2001 with a do-it-yourself home coffee roaster from his wife, and the company now has additional locations in Little Italy, Bay Park, Del Mar, and a recently-opened outpost in Pacific Beach. In early 2017, Bird Rock Coffee Roasters was purchased by PT's Coffee Roasting Co. of Topeka, Kansas. Patton remains on the company's board of directors and is the head buyer for both Bird Rick and PT's Coffee companies. Casero Taqueria - From Craig Applegate and Clayton Wheeler, the team behind the popular local sandwich chain Board & Brew, Casero Taqueria will be a 5,000 square-foot, casual, family-friendly destination for authentic tacos and other Mexican specialties. Inspired by Baja's Valle de Guadalupe, Casero will have a menu from consulting chef Alex Carballo centered around wood-fired proteins served on house made tortillas. The restaurant will also have a full-service bar with a menu designed by Snake Oil Cocktails. Ebullition Brew Works - This Vista-based craft brewery first opened in July 2017 and is already moving forward with a second location. Expect multiple taps serving Ebullion's various styles of beers, available for onsite consumption or for take away by growler or crowler. The Grove Bakery - From Burton Restaurants, which owns Lemon Grove Bakery and several area Dunkin' Donuts locations, The Grove Bakery will dish out luxurious custom wedding cakes, pastries, pies, cupcakes and other desserts. Mango Mango Fresh & Healthy - This South County-based healthy food concept will bring its third location to Carlsbad, offering a large selection of smoothies, juices, fruit bowls, soups, salads, breakfast plates, and sandwiches. Mendocino Farms - After a successful openings of location in The Shops in La Jolla Village in 2016 and Del Mar Highlands Town Center in 2017, Los Angeles-based Mendocino Farms sandwich market will their third San Diego outpost in Bressi Ranch with a menu of signature sandwiches, salads and sides. Richard Walker's Pancake House - Since 1948, the Walker family name has become synonymous with outstanding gourmet pancakes and breakfasts in San Diego. This will be the company's fifth location, third in San Diego County, which will offer a large selection of breakfast dishes and lunch entrees. 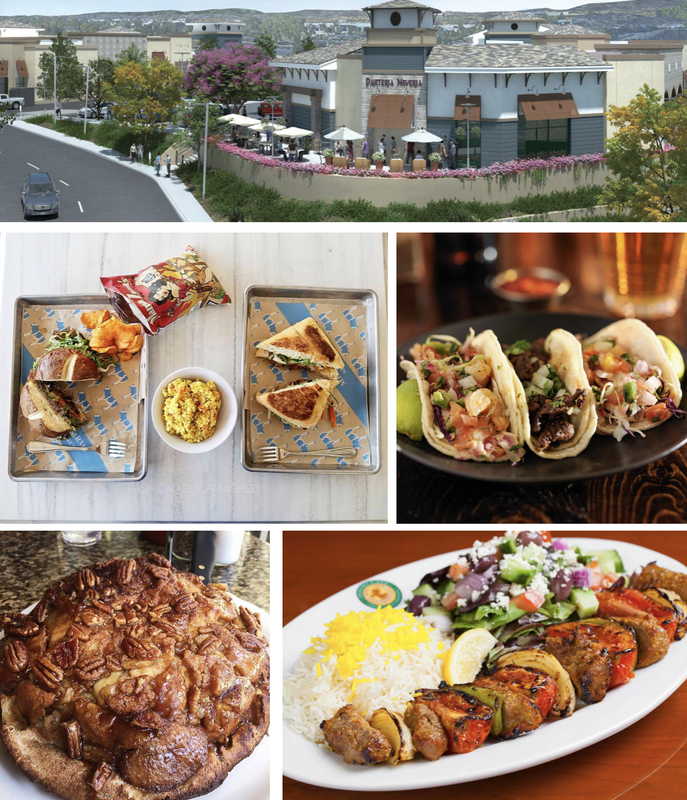 Panini Kabob Grill - After recently opening its first San Diego location in Del Mar Highlands Town Center earlier this year, Panini Kabob Grill will open a second area branch with a menu centered around an Italian-Mediterranean fusion of health-focused dishes. Wood Ranch BBQ - The 17th location of this California-based barbecue chain will open in Bressi Ranch in 2019, offering a menu of Tex-Mex, BBQ-focused menu with smoked meats, premium seafood, oak-grilled steaks, burgers, sandwiches, salads and more. The Square at Bressi Ranch will open as early as this spring at 2674 Gateway Road in Carlsbad, CA. For more information, visit sheaproperties.com/retail/detail/24/the-square-at-bressi-ranch.